This is a picture of the sandwich - one bite and you are in heaven! Note the perfect size too - unlike the huge Carnegie or Katz's offerings in the USA. This shows the medium meat so there is just the right amount of fat with the meat, and this combination makes for a great taste. Lean meat is also available but that is to be avoided, and then full fat or gras style is also available, and that is too extreme on the other end - too rich. In the picture, the slices that look whole will taste very tender, given the fat with it. 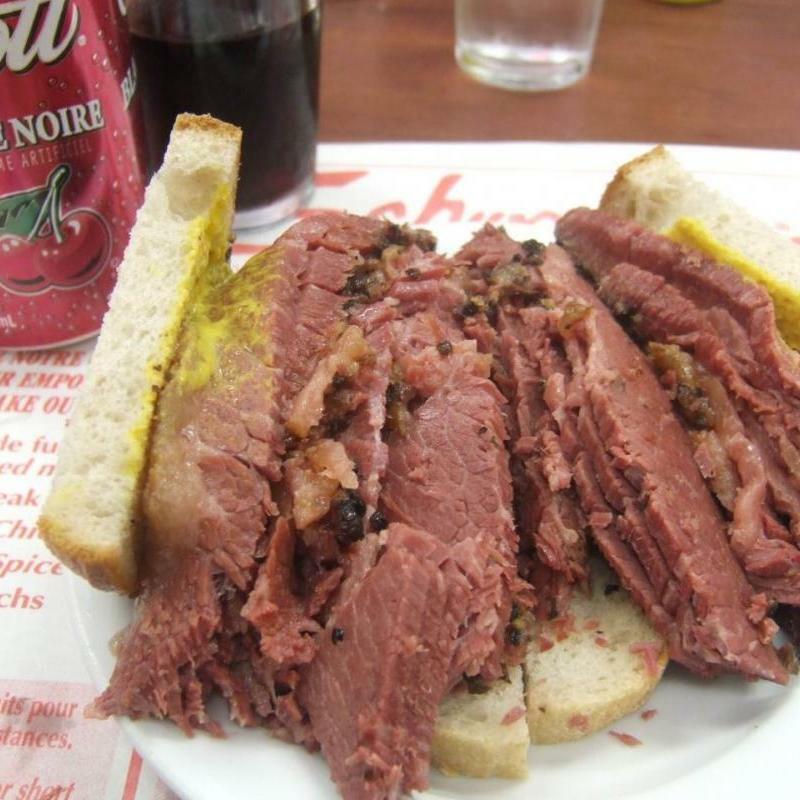 It is this combination of hand-sliced meat, meat that fall apart easily, and the small slivers of lean meat, and the special spices that make the Schwartz's experience so different from other smoked meat places which seem to have a more orderly, sameness in consistency all across, and spices not as good - Schwartz's beats them all in taste and experience. The color is the first indicator - smoked meat that is pink or light red - and not dark red - never tastes as good as the dark red smoked meat. Additional comments in the Schwartz's Jewish Deli posting. Sampling of the price of the sandwich in $CAD - an inflation indicator!